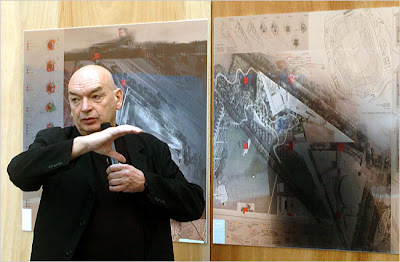 Well, all the lobbying for Jean Nouvel as one of the pre-emininent Veg.itects of our time has paid off with the recent announcement that he was recently awarded the Pritzker Architecture Prize for 2008. While not as prestigious as aforementioned PVP, congrats are in order all the same. A review and acknowledgement that there are is a long line of storied architects whom have claimed this prize. Vegetated Architecture is not on the list of requirements, but fit nicely into the overall theme: "The purpose of the Pritzker Architecture Prize is to honor annually a living architect whose built work demonstrates a combination of those qualities of talent, vision and commitment, which has produced consistent and significant contributions to humanity and the built environment through the art of architecture." His most known work of Veg.itecture is the oft-viewed Musee du Quai Branly in Paris. From the NY Times overview of the Pritzker award: "The bulk of Mr. Nouvel’s commissions work has been in Europe however. 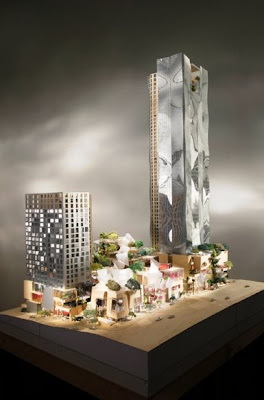 Among the most prominent is his Quai Branly Museum in Paris (2006), an eccentric jumble of elements including a glass block atop two columns, some brightly colorful boxes, rust-colored louvers and a vertical carpet of plants. “Defiant, mysterious and wildly eccentric, it is not an easy building to love,” Mr. Ouroussoff wrote in The Times." 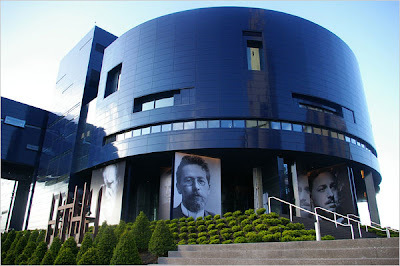 One building in the US I did get to see and like (but was frankly underwhelmed by the landscape architecture) was the Guthrie Theater in Minneapolis, perched on the revitalized waterfront and making a bold statement for somewhat hum-drum prairie design. Not Veg.itecture, but a fine and tangible personal Nouvel project. 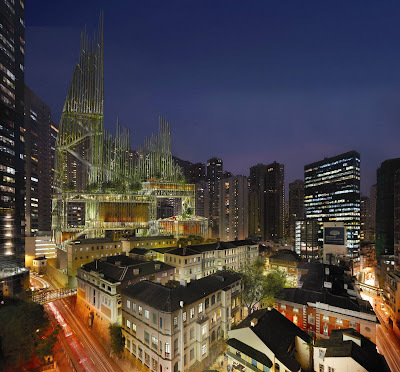 So as we celebrate Nouvel, we turn our attention to some of the recent Vegetated Architecture that is changing the face of the dual intertwined professions of landscape + architecture. Some notable additions to delicately place on foam, stick pins neatly skewering the corners, and a curt, hand-written label to the side. So perhaps my heavy-handed allusion to specimen collecting was not lyrical enough to preface the announcment of 'The Worlds Biggest Butterfly House' happening in the UK, as reported on Treehugger. 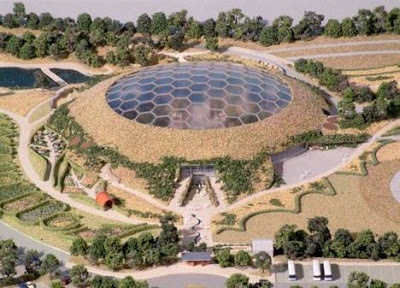 The project looks somewhat funky (perhaps just representational, as the buff colored materail reminds me of kitty litter) with it's geodesic dome and earth-sheltered pupae, nestled into the landscape of meadows and gardens. Probably something only a butterfly or Bucky Fuller could love. The next project has a striking form, and has the press-cred to warrant lots of exposure... as well as some subtle integration of building and landscape in poetic and functional ways. 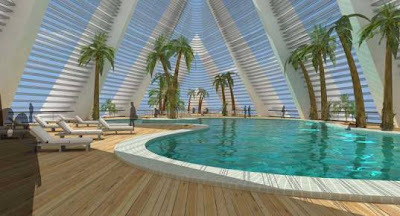 Via Inhabitat, the design for Precinct 4, by Studio Nicoletti Associati and Malaysian architects Hijjas Kasturi Associates, "...is a refreshing and original with unique, marine-inspired structures - which also draw from traditional Islamic designs - arranged in a permeable, radiating block of bioclimatic architecture." 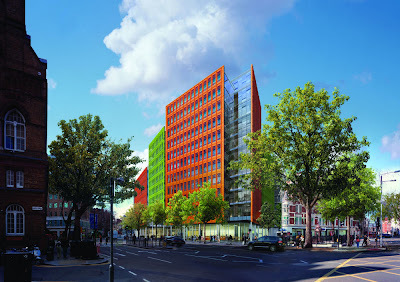 A new building on World Architecture News in London by Renzo Piano (a Pritzker alum) knocked me over with a smashing green facade (until i realized it was merely a green wall of ceramic and glass, un-vegetated). Oh well, it's a nice thought. 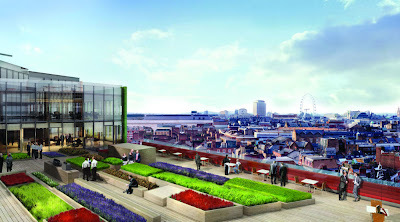 The project didn't disappoint, with a wonderfully rendered (if someone monocultural) rooftop terrace to more than make up for my disappointment. While we're talking Starchitects and former Pritzker winners, a new one in LA by Frank Gehry has vegetation toppling down a cascade of building forms. Following our recent post on significant Los Angeles open spaces - this submittal include park connectivity as a major feature. From World Architecture News: "Also to be improved as part of the project is the existing County Mall, which will be transformed into a 16-acre park stretching from the Music Center at the top of Bunker Hill to City Hall at the bottom of the Hill. The park will become the new "Central Park" of Los Angeles and will be the scene of many citywide celebrations as well as daily events." And to shift gears somewhat - and pick up a much earlier thread of growing your own Treehouse - growing your own park structure. 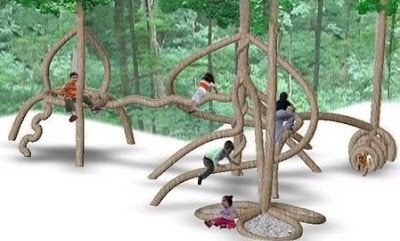 Via Treehugger, a company named Plantware's approach: "...is known as tree shaping, arborsculpture, living art or pooktre." Pooktre? I thought we were talking about Pritzker? Anyway, I gotta remember that one for Scrabble anyway. A notable quoate from Treehugger by Plantware CEO explains the inspiration: "A fantasy about building houses from living trees, inspired by the ficus tree, whose roots create amazing forms. We discovered a way to control the direction in which a tree grows, which can be used to grow structures that will be useful and environmentally-friendly." If you have the time, I'd definitely recommend it. This is definitely not a new phenomenon, as Treehugger points out. 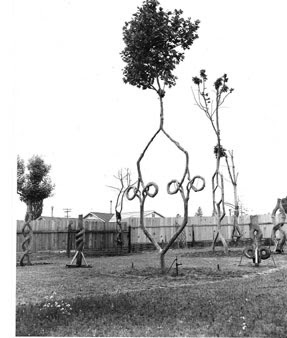 On a related note - pooktre pioneer Axel Erlandson from California: "...started shaping trees in 1925, and by the late 1940's opened up "The Tree Circus," a tourist attraction which has now been transplanted to an amusement park in Gilroy, California." Time to play, veg.itect style. 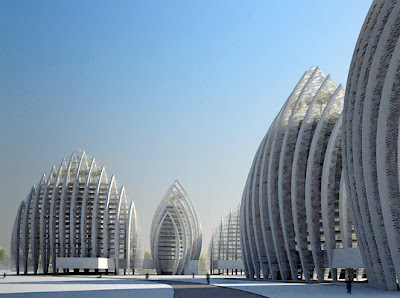 I bet Nouvel would love these... and what's next, the Pooktre Vegitectural Prize? Why not?